3rd Chalkwell Bay is a registered charity, run by a team of dedicated volunteers. We rely on donations and fundraising, along with our members subscriptions, to keep the Group running and ensure Scouting in Old Leigh affordable for all. Over the course of a year we run a number of fundraising events, from quizzes and curry nights to large events like Old Leigh Regatta. The Scouts are always involved in these events and families are welcome and encouraged to join in too. Scroll down for a list of our current fundraising events. If you would like to make a donation we are working with the Charities Aid Foundation (CAF) to receive these online using the form below, or please contact a member of the leader team. If you work for a company who sponsors youth projects, have skills to offer, have fundraising ideas or can help out with events or grant submissions please let us know. Taking part in an event? Running a marathon, taking part in a cycle ride or any other charity event. Why not choose 3rd Chalkwell Bay as your nominated charity. We can help out with publicity and are set up online with Just Giving and MyDonate to take the hassle out of sponsorship money. 3rdCB have also teamed up with EasyFundraising, which gives us a donation every time you buy something online from a huge range of stores including Amazon, eBay, Argos, Expedia and Tesco. It’s free to sign up and really simple to used. Once you’ve signed up every time you buy online, take a look on the Easy Fundraising site to see if your favourite shop is listed. If you buy, they donate a small percentage of the value back to 3rdCB – but you still pay the same price in the shop! Click here to find out more and sign up. By signing a Giftaid declaration we are able to claim back an additional 25% on all donations and subscriptions from HMRC, which over the course of a year is a significant amount. For parents, if you’ve not already filled out a Giftaid form, please download one here and return it to your child’s section leader. 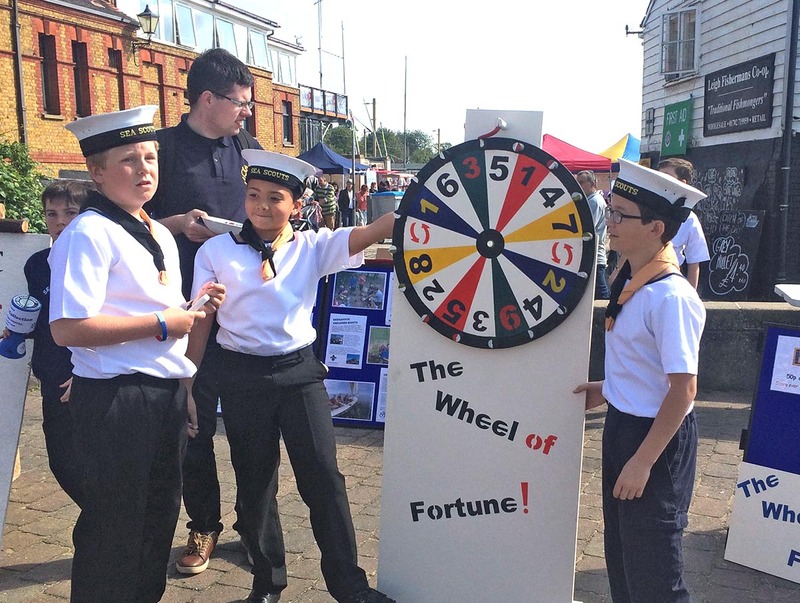 The Leigh Regatta in Leigh-on-Sea is an annual community & charity event organised by the Sea Scout/Explorer Groups based in the Old Town along with the Leigh Lions. Each year, the event raises money for nominated charities as well as for the local Scout Groups around Leigh-on-Sea. The Old Leigh High Street will close for the whole day, allowing the Leigh Regatta to take full advantage of the space for all the entertainment, craft stalls, side shows, competitions and water events, including sailing run by EYC & LSC, the Scout Pentathlon, Cub Welly Hoying, live music, fun stalls and entertainers. All Scouts & Explorers are asked to help on stalls, raise money and set up/pack up on the day. We also need support from parents and families on stalls and in the tea tent, and donations of prizes for our stalls which raise funds for 3rdCB. This is our biggest fund raising event of the year, if you can help out please talk to any of the leaders. We’re after donations of cakes, teddies, jumble and old crockery, so if you like backing or are having a post-summer clear out, please drop them into The Den before the Regatta. We’re also after adult help in the tea tent and on the Scout stalls on the day. If you have an hour or two free and are able to help out please drop us an email at TheDen@3rdCB.org.uk with when you’re about to we can put a rota together, or just pop down on the day and talk to one of the leaders.